Injuries can strike unexpectedly and have a number of causes. When they do, even a minor injury, such as a sprain or a fracture, can have a severe impact on your life. It can impact your ability to work, care for your children or fulfil your responsibilities. Injuries can also cost you money in lost earnings, prescriptions and medical costs, not to mention the pain and inconvenience of the injury itself. A major injury can put your life on hold for months or years, turning your life – and that of those around you – completely on its head. We are conditioned to think that accidents ‘just happen’ and to not think much of it, but there is always a cause to an injury. Sometimes, such as when an injury occurs at work or in the street, another person or business may be wholly or partially responsible. In these circumstances you may be able to claim compensation to make your life a bit easier and offset the expense of your injury. This is where Rebecca and I can help you. Below are some of the most common causes of personal injury claims in the Leeds area. If you have experienced an accident -related injury over the past three years, chatting to a personal injury solicitor may be the first step in getting your life back. The first step to finding out if you are due compensation for an injury is to have an informal chat with us about the causes of your accident. We are here to help and will give you impartial advice about the best approach to take and what compensation you could claim. You can then decide – with our support – whether to pursue your personal injury claim. 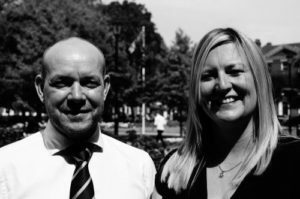 John and Rebecca are experienced injury lawyers serving a local client base in Leeds and the surrounding area. To request a call back, please fill out our online contact form, or call the office on 0113 357 1165.